This report is divided into two sections—boron mineral markets and boron chemical markets. 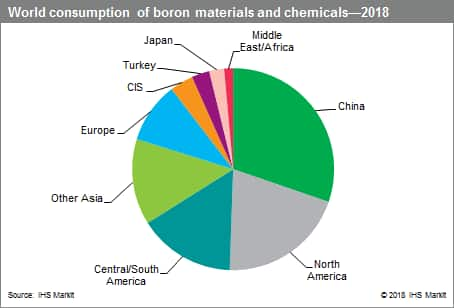 Boron chemical markets are separated into large-volume primary chemicals—boric acid and various borates—and smaller derived boron chemical markets—boron halides, boron carbide, elemental boron, and borides, as well as other specialty boron chemicals. The global market for boron minerals and chemicals grew significantly over the past five years as a result of growing markets, mainly in Asia, and with the recovery from the global economic crisis. The two main consuming markets, glass and ceramics, are closely linked to the construction industry, and accordingly had suffered tremendously from the crisis in the construction markets of North America and Europe. Both markets have recovered only very slowly after the economic downturn in 2009, and it was therefore mainly because of increasing consumption in Asia, and to a lesser extent Central and South America, Africa, and the Middle East, that the market grew overall at healthy rates. Major deposits occur in South America, Turkey, and the United States in the form of ores and brines. At the Kramer deposit in California and the Kirka deposit in Ankara, Turkey, open-pit mining methods are used to mine two very large deposits of high-grade beds of tincal. South American borates are primarily ulexite but deposits of tincal and howlite are also mined. In Russia, datolite, a calcium borosilicate, and szaibelyite, a magnesium borate, are mined in low-grade deposits. China also produces borates from low-grade deposits of brines and szaibelyite (ascharite). The world market is dominated by Turkey and the United States, and also by the two large producers in these countries. In the United States, Rio Tinto Borax is the largest producer, and the company produces both minerals and downstream primary boron chemicals. Turkey has only one large producer, Eti Maden. This company also produces minerals and primary boron chemicals. The demand side of boron compounds is dominated by a few large consuming segments—textile glass fiber, insulation glass fiber, enamels and glazes, and agriculture. Any of these uses may consume either boron mineral directly or derived boron chemicals as the source of B2O3. The decision to use mineral versus chemical boron is determined by the full cost associated with either alternative. Production of flat display panel glass, like that of LCD, is one of the major boron consuming areas with growing importance. Flat panel glass production has increased dramatically since consumer preference shifted from cathode-ray tube (CRT) TVs to flat panel screens. About 11–13% boron oxide is used in flat panel glass production. Asia is the primary area of growth for textile glass fiber demand because of growth in demand for reinforced materials in the printed circuit board, automobile, shipbuilding, construction, and chemical industries. In North America, growth in the marine industry is expected to continue and to contribute to textile glass fiber consumption growth. In Europe, the industrial and agricultural sectors, with consumption of composites for silos, tanks, and construction parts, are expected to increase consumption.